The UWI Regional Headquarters, Jamaica. 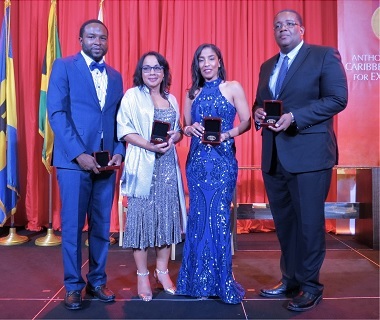 Friday, April 5, 2019—Internationally acclaimed Climate Scientist and Dean of the Faculty of Science and Technology at The University of the West Indies’ (UWI), Mona Campus Professor Michael Taylor was among those celebrated by the ANSA McAL Foundation at its Caribbean Awards for Excellence ceremony last Saturday, March 30 at the Sandals Royal, Barbados. 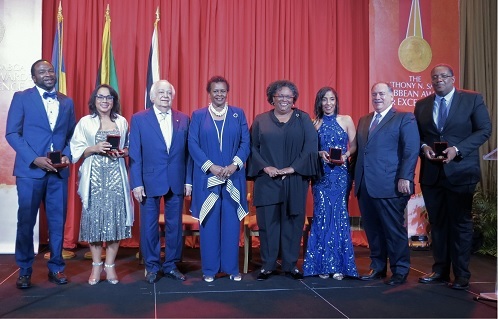 (l-r) Corey Lane, Danielle Dieffenthaller, Sir Shridath Ramphal, Dame Sandra Mason, Prime Minister the Hon. Mia Mottley, Kimala Bennett, Mr A Norman Sabga, and Prof Michael Taylor.